2004, Village Bears' exclusive and third no/no bear. 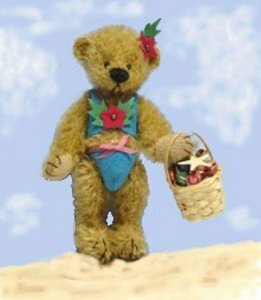 3" Sally is dark carmel mohair (sun tanned),wears a two piece swim suit, made from turquoise ultra suede and accented with a bow and flowers. She carries her basket of shells that she is selling. Look close and you will find each basket includes a Tampa Bay star fish too. Sally has been produced in a Limited Edition of 100 and each basket is unique, hand made and assembled with it's special assortment of shells.